Contemporary biomedical and clinical research is undergoing constant development thanks to the rapid advancement of various high throughput technologies at the DNA, RNA and protein levels. These technologies can generate vast amounts of raw data, making bioinformatics methodologies essential in their use for basic biomedical and clinical applications. 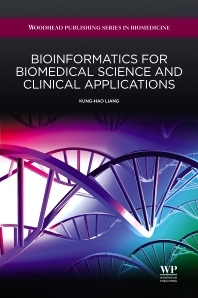 Bioinformatics for biomedical science and clinical applications demonstrates what these cutting-edge technologies can do and examines how to design an appropriate study, including how to deal with data and address specific clinical questions. The first two chapters consider Bioinformatics and analysis of the human genome. The subsequent three chapters cover the introduction of Transcriptomics, Proteomics and Systems biomedical science. The remaining chapters move on to critical developments, clinical information and conclude with domain knowledge and adaptivity. Kung-Hao Liang is a senior bioinformatician working at the Liver Research Center, LinKo Medical Center, Chang Gung Memorial Hospital, Taiwan. His work focuses on the power of genomics and systems biology to fulfil medical requirements and he is the author of a wide range of publications in the genomics and medical fields. LinKo Medical Center, Chang Gung Memorial Hospital, Taiwan R.O.C.